The Globe Theatre in London has been linked with Shakespeare through 400 years and three buildings. On this page we’ve picked out the top, verified facts about The Globe Theatre. Elsewhere on NoSweatShakespeare we give an overview of life at The Globe Theatre in Shakespeare’s time, and paint a picture of the entertainment available at The Globe…but if you’re after interesting facts about Shakespeare’s Globe Theater, read on here! The Globe Theatre was built between 1597 and 1599 in Southwark on the south bank of London’s River Thames, funded by Richard Burbage and built by carpenter Peter Smith and his workers . The timber for The Globe Theatre was actually reused wood from “The Theatre” – an earlier theatre owned by Richard Burbage’s father. The Globe was built as a large, round, open air theatre. There was a roof around the circumference which covered the seating area, leaving the theatre looking like a doughnut from above. 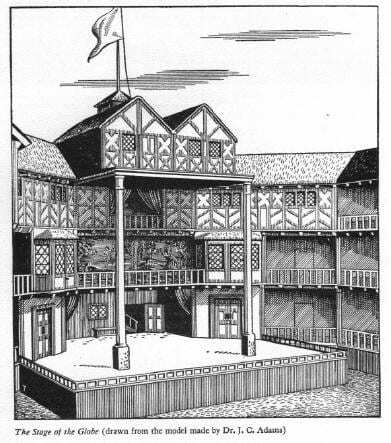 The architectural style of The Globe was similar to the Coliseum in Rome, but on a smaller scale – other Elizabethan theatres also followed this style of architecture which were called amphitheatres. The Globe had three stories of seating and was able to hold up to 3,000 spectators in its’ 100 foot diameter. At the peak of summertime the groundlings were also referred to as ‘ stinkards’… for reasons that may well be obvious! Part of the stage was called the “apron stage” – a rectangular platform that thrust out amongst the audience into the pit. William Shakespeare was a shareholder who owned 12.5% of The Globe Theatre. As a young writer Shakespeare bought shares in the theatre and benefited financially as his popularity grew. Colour coded flags were used outside the theatre to advertise the type of play to be performed – a red flag for a history play, white for a comedy play and black for a tragedy play. A crest above the main entrance to The Globe Theatre was inscribed with motto “Totus mundus agit histrionem” – Latin for “The whole world is a playhouse”. A trumpet was sounded to announce to people that the play was about to begin at the Globe Theatre in order for people to take their final places. There were no actresses performing at The Globe Theatre – or any other theatre at that time. Female roles were played by young boys as theatre stages were considered too risque a place for ladies. Outbreaks of the Bubonic Plague were so serious in London that the Globe Theatre was forced to close in 1603 and 1608 to restrict its’ spread. The Globe Theatre burnt down in 1613 when a special effect on stage went wrong. A cannon used for a performance of Henry VIII set light to the thatched roof and the fire quickly spread, reportedly taking less than two hours to burn down completely. According to one of the few surviving documents of the event, no one was hurt when The Globe Theatre burned down – except for a man whose burning trousers were put out with a bottle of beer! After burning down in 1613 The Globe Theatre was rebuilt on the same spot in 1614. The Puritans brought an end to The Globe Theatre in 1642 with an order suppressing all stage plays. In 1644 The Globe Theatre was turned into tenement housing, ending 85 years of turbulent history. The Globe was generally considered to be a circular building, however when a small part of the theatre’s foundations were uncovered the late 1980’s it seems that the building was actually a polygon of 20 sides. In 1997 a third version and faithful reconstruction of The Globe Theatre was built as “Shakespeare’s Globe Theatre”, close to the original site in Southwark. This new Globe Theatre was built using 1,000 oak trees from English forests and 6,000 bundles of reeds from Norfolk for the thatched roof. What do you think of these facts on Shakespeare’s Globe Theatre? Any interesting facts we’re missing (that you can’t find on our Shakespeare facts page!)? Join in the comments below. Who opened and operated the globe? Did you know that the fact 18 is a fact and it was indeed rebuilt in the 1614. SO MR DYLLON IF YOU WANT TO COMMENT SOMETHING BEST MAKE SURE YOUR RIGHT!!!!!!!!!!!!!!!!!!!!!!!!!!!!!!!!!!!!!!!!!!!!!!!!!!!!!!!!!!!!!!!!!!!!!!!!!!!!!!!!!!!!!!!!! How does thou know? Was thou there??? How much were the takings from a performance, and per annum, at the Globe Theatre? How much did shareholders like Shakespeare earn? Thou is welcome to explore my theater. Aye? Shakespeare did act in some of his plays. It’s actually one of the very few proven facts about him. He didn’t play any major roles. They were only small ones. He never played Romeo or Macbeth or anything like that. However, we do know he played the ghost of King Hamlet.